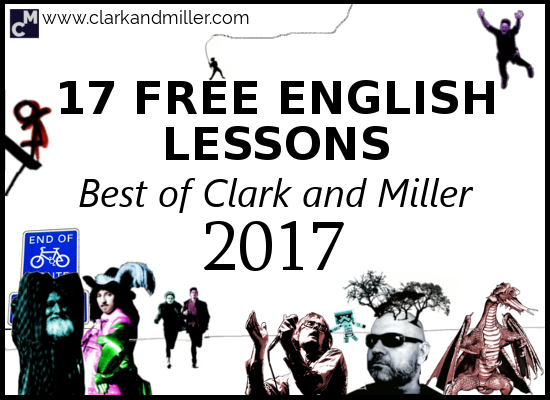 Today, I’m going to show you the 17 best free English lessons from Clark and Miller in 2017. And you survived it. Congratulations! When you’re learning a language, it’s really, really helpful to go back and review what you’ve learned over the year. So I’ve taken a look at all the English lessons I wrote in 2017 and divided them into 5 categories so you can check them out in a reasonable and organised way. Because I know how reasonable and organised you like to be! Some lessons this year were all over social media. Let’s revisit them and see what all the fuss was about. Well, not exactly, but these ones were a little controversial. Hey, it’s New Year’s — time to go to parties and meet people. But you might need some phrases first, right? This year had a strong focus on sounding more natural in English. Sound less like a robot with the advice in these lessons. These ones are my babies. I love them. Don’t touch them! Some of the free English lessons this year really went crazy on social media. If you shared any of these, then you rock, and I’d love to buy you a cup of tea one day. There’s a reason this lesson has the adjectives “big” and “fat” in the title. There are a lot of sites out that that give an overview of the tenses, but a lot of them are very dry, and most learners probably fall asleep halfway through reading them. So I wrote this to show you the “big picture” of English grammar in a way that makes you understand it all so much more easily. Hopefully, it also won’t make you want to scream. Starting a book in English is easy, right? We can all start reading a book. But how many books in English do you finish? And why are there so many that you don’t finish? In this lesson, I answer that rather important question and suggest some good books to get you started. Do you need to communicate with British people much, either at work or in your social life? One of the tricks to understanding Brits and their weird ways of speaking is by learning some of the idioms that they use. So here are 8 of the most common British English idioms. Again — one of the reasons British people can be so hard to understand is the fact that they use strange phrases and idioms. If you need to understand what Brits are saying, this is another must. OK. It didn’t really make anyone angry, but there were a couple of lessons this year that some people really disagreed with. If someone disagrees with you, it can be a good thing because you talk about it, and it generates interesting discussion. Some people didn’t like this lesson because it contained a lot of “incorrect” grammar. That’s a fair point, but this lesson is really useful if you need to communicate with British people. That’s because a lot of British people don’t really care about the grammar being correct. So you’ll need to be able to understand them when they say these weird things. It’s probably an exaggeration to say that reported speech is a waste of time. But most natural English speakers use different expressions when they report what people say. Do you need to understand the English speakers in a random course book, or do you need to understand the English speakers in the real world around you? If your answer is “real world English speakers, please,” then this lessons is for you! Have you got any parties planned? Hoping to meet some new people? These lessons are designed for you to get awesome at meeting new people and socialising successfully in English. It’s a really simple thing, but somehow, it’s also the most difficult thing ever. Not just meeting people and talking to them. But also meeting people, talking to them and not feeling stupid. I know, I know … this seems easy. But you’d be surprised how many people get it wrong. Also — you don’t want to say the same thing every time someone asks you how you are. This lesson will show you how to add colour and variety to this very important part of socialising. Sounding natural isn’t just about the “correct” grammar or the “right” vocab. It’s also about using the right phrases and structures and cutting out unnecessary words. Unless you want to sound like a robot. Or a zombie — grrr! When you’re at a high level of English, things get tricky. You’ve come a long way and you’ve learned so much grammar and so much vocabulary. But now you need to change strategy. One way to start is with your mistakes. These are 4 of the most common fluency or “naturalness” mistakes I hear in high-level English learners. One thing that makes learners sound quite unnatural is repetition. One thing that makes learners sound quite unnat… just joking. It can be difficult to express some things without repeating yourself a lot. Here are two neat little tricks that will make you sound twice as natural and cut the number of words you use, giving you more time. For smiling and eating! Wanna hear some good news? There are some things that you might be saying that sound unnatural BUT can be fixed with a tiny little change. You can go from sounding a bit difficult to understand to sounding like a master with the smallest of fixes. Here are four of these fixes. Words are a waste of time! Let’s look at pictures instead. It’s easier and you can remember them more easily. These free English lessons were the ones I enjoyed writing the most. Maybe it was that I was happy to make a complicated concept clear, which felt good. Maybe the images looked amazing, which felt good. For some reason or another, these were my favourite lessons of the year. It’s weird. Wherever you go, there’s a sign telling you to do something or not do something or remember something or forget something. But for English learners, some of the signs are not that easy to understand. So I took photos of them and put them into a quiz. If you’re planning a trip to the UK (or if you already live there), you’ll want to know what these signs mean. One of the best ways of improving your listening skills (and your happiness) is through music. So I talked to a lot of other English teachers and students and made a list of bands that are great to learn English from. Also — isn’t it great discovering new music? When you look at a new word in English and try to remember it, what happens when you see it again? Do you understand it immediately? Of course not — these things take time. But what if we just don’t have enough time? Well, there’s a neat strategy you can use to remember words much faster. In this lesson, you’ll see 9 advanced English words and 9 images that will make you remember those words. Forever! Don’t let your teacher tell you that grammar is everything. But the grammar rules you learn in books get broken ALL THE TIME! In this lesson, you’ll see how the present continuous isn’t always for actions happening now and the present simple isn’t always for general habits and states. A lot of learners love phrasal verbs. But a lot of learners hate them. Either way, there’s a time and a place for phrasal verbs. Sometimes you should use them, sometimes you shouldn’t. Find out the right time and place for these 25 phrasal verbs. That’s it — the end of a fantastic year. I hope the free English lessons here help you out and give you the extra boost you need. Now — time for the party, yeah? Happy New Year and may 2018 be the game changer for your English goals! Did you find this useful? Do you know any people (or snowmen) that might also benefit from this? Then BE AWESOME AND SHARE! Spread the knowledge! Thank you so much, Gabriel! Brilliant posts this year. I’ve shared this one too. I’m looking forward to reading and sharing more in 2018! Thanks so much Ruth! You rock! Hello! Happy New Year ! I am really greatful to you for your lessons. That was fun! As for the 22 Bgitish signs, well I got 17 of 22, but it was tottaliy impossible to do without tips. Phrasal verbs are total disaster for me. And one more question – what is the difference in using the verb TO HAVE and TO HAVE GOT ? Good work on the signs! Yes — some of them are really not very well graded to say the least! The quiz is basically there for you to discover what you didn’t know so you could check it out. Btw — well done for getting 17 out of 22 — an impressive score considering how difficult it was! In fact some Americans told me that they didn’t know what some of them meant! Yes — phrasal verbs are everyone’s idea of some sort of hell! But just keep going with them! One of the best things you can do is spend some time trying to figure them out from context by listening to a Listening Project post again and again or by reading a text several times (from a non-formal source like an Iain Banks book). So let’s say you have a desire to eat some sort of massive cake. You can simply express this by saying, “I want to eat some sort of massive cake,” right? But let’s say you enjoy the feeling AFTER eating the cake — that lazy, full feeling. How would you express it? You have the same verbs, right? (“want” and “eat”), but it’s a bit different because although the first verb “want” is in the present (it’s what you want now), the second is for the past (the eating of the cake is finished). So we take the second verb and “push” it to the past. Normally we do this by making the verb past tense, but we can’t do that here because it’s an infinitive (“to eat”). But perhaps that wasn’t quite what you meant? If you’d like to know the difference between “have” and “have got,” then read on! When in the present tense (“I’ve got a really annoying cousin” / “He has a serious problem when it comes to driving properly”), there’s not really a big difference. I think some Americans aren’t familiar with “have got,” but I’d say they’re interchangable. The only difference comes when we want to change tenses — to the past or the future. There is no past of “have got” (“had got” to mean “had” sounds a bit weird and old-fashioned), and there is not future (“will have got” becomes something different. So when talking about the past or the future, we’re stuck with “had” or “will have,” “gonna have,” “having” etc. If a may in(t)erject, “I want to have eaten cake.” — such a dandy for my liking, I’d say “to gormandize”… hang on a tick, though! Excuse me, but — since when and in what universe, my good sir 😉 “to have got” and not a proper “to have gotten” the grammar boffins call a “perfect infinitive”, eh?! Thank you for such a ditailed answer! That`s what I really wanted to know!